Jenni Putney, Gordon Clapp, and David Mason in Trick or Treat. Photo by Heidi Bohnenkamp. BOTTOM LINE: This pitch-black comedy manages to find humor in the unearthing of buried family secrets. The family at the center of Jack Neary's Trick or Treat unearths plenty of tricks, but certainly no one here is in for a treat, except perhaps the audience. A light-up pumpkin and plastic skeleton add a festive touch to the homey set, but the real skeletons are hidden in the family closets, and on this dark night they are ready to leap out and drag hidden secrets into the light. The play opens with Johnny Moynihan (Gordon Clapp, of NYPD Blue fame) calling his adult daughter Claire (Jenni Putney) over to tell her about a dire situation with Nancy (Kathy Manfre), her Alzheimer's addled mother. As Johnny slowly tries to explain what has happened, they are interrupted with a flurry of trick-or-treaters, all of whom have scouted out the family house for its tradition of passing out full-size candy bars (which Johnny frequently boasts that they are famous for). Claire assumes that caring for her mother has gotten too hard for her father and she spreads a range of brochures for assisted living facilities on the coffee table, suggesting which ones would be the right ones to send her to. It turns out that their problem is far, far worse. Overly zealous kids at the door continue breaking in on the heated discussion between Claire and Johnny, pushing Claire into candy-related violence. This behavior draws in Hannah (Kathy McCafferty), the neighborhood gossip and ex-girlfriend of Claire's brother Teddy (David Mason), who can smell that something is awry in the Moynihan home. Teddy, a police officer, arrives to do damage control, and is appalled to see his ex in the family home. The first half of the play is suspenseful drama mixed with dark comedy, as the family tries to force Hannah out of the house and away from their secret, but her extreme sense of self righteousness helps her to stand firm. Teddy physically threatens Hannah, and she alludes to his long history with anger problems, finally commenting, "This is a family of animals." These comments propel the story one step closer to revealing the secrets at the heart of the family's tensions. Under the direction of Carole Dunne, each cast member convincingly navigates the play's twists, turns and changes in tone, challenges that might have easily sabotaged the show in lesser hands. Mason in particular is adept at playing a character with unstable emotions and hidden truths. Dunne's direction propels Neary's script forward as new truths and hidden motivations are unearthed. 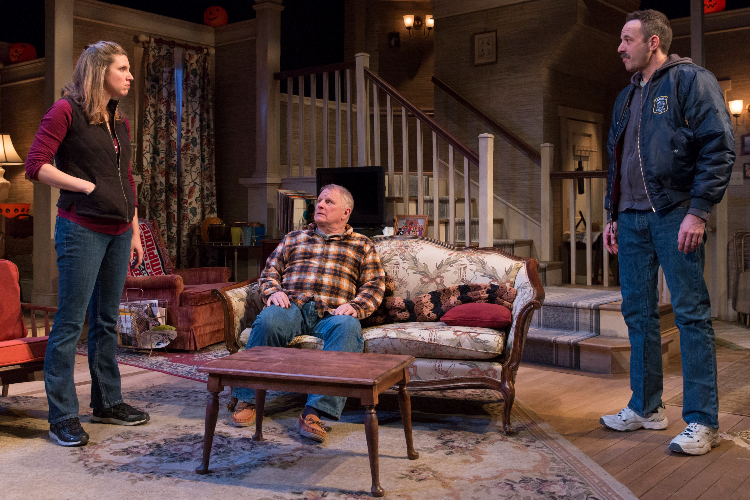 The extremely detailed and authentic set designed by Michael Ganio effectively evokes the setting of a working class East Coast family home, replete with a partially done jigsaw puzzle, Red Sox blanket, and vintage Barcalounger. Allison Crutchfield's costume designs also feel authentic to the setting and background of the characters. This impressive design bolsters the skilled performances to create a very polished production. Trick or Treat straddles the line between genres, with a dramatic ending in which the family excavates its history, and Johnny comes to realize that he has enabled his son's worst qualities. The ghosts and skeletons haunting this clan on a Halloween night live in the darkness with their buried secrets. Trick or Treat is by Jack Neary. Directed by Carol Dunne. Scenic Design by Michael Ganio. Costume Design by Allison Crutchfield. Lighting Design by Tyler M. Perry. Sound Design by Ben Montmagny. Fight Director is Paul West. Production Stage Manager is Kristin Herrick. The cast is Kathy McCafferty, Gordon Clapp, Kathy Manfre, David Mason, and Jenni Putney.